On April 6, Blaise Zingale ’19, Jose Parral ’19, and Sebastian Smith ’21 boarded a flight and headed to Minneapolis to compete in the Collegiate Rocket League spring championships. When the trio signed up for the tournament in February, they hardly expected to make it to the top of the Western Conference bracket, let alone to the season championships. Rocket League, a video game that was first released in 2015 by Psyonix, “is like playing soccer but with cars that can fly,” says Parral. Each game is played in a digital arena environment by a single player or teams of three, and the team that scores the most points in a five-minute-long game wins. As esports—a form of competition using multiplayer video games—have grown in popularity, many collegiate esports teams have sprung up at colleges and universities. The National Association of Collegiate Esports (NACE) now includes 140 institutions in 41 states with formal esports organizations. Some universities are even recruiting talented players with scholarships—NACE reports that $15 million was awarded in esports scholarships for the 2018-2019 school year. At the University of Redlands, esports have grown as an expression of student interest. Zingale and Parral, who have been roommates for years at the University of Redlands, played Rocket League recreationally for two years before deciding to register for this year’s competition; Parral then recruited Smith to join them after meeting him in an engineering seminar. This year, teams in the tournament—created by Tespa, an esports company that specializes in collegiate video gaming—competed for the top spots in four regional divisions to claim part of the $50,000 prize. From February 16 to March 20, the U of R team competed in single-elimination games, ultimately beating University of Arizona—last year’s grand champion—in the Western Conference final. Zingale, Parral, and Smith were awarded $7,500 as a team for winning the conference. On April 7, the University of Redlands Rocket League team lost the semifinal game to the University of Akron, who went on to win the championship. Even without the championship title, Zingale, Parral, and Smith are grateful for experience. “It’s been amazing to be introduced to the community of players in the tournament and gain exposure as an esports player,” says Parral. Over the past few weeks, the team has been in talks with faculty members and students who are interested in founding an esports club on campus. In addition to Rocket League, other online games such as League of Legends, Overwatch, and Counter-Strike are played by collegiate teams. 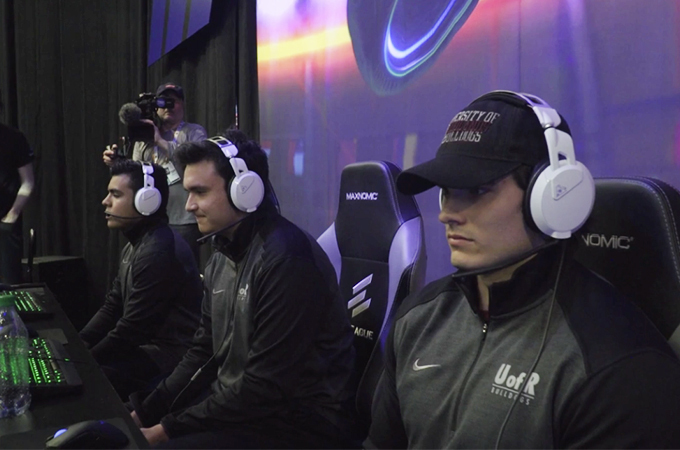 As Zingale and Parral approach graduation, they hope to leave Smith with an established group of students passionate about engaging in esports. Those who are interested in joining the University of Redlands esports community can reach out to Blaise, Jose, or Sebastian. Learn more about Student Affairs and clubs and organizations at the University of Redlands.